Most owls are almost perfectly adapted to life in the dark. Their vaguely humanoid faces reflect the spectacular evolution of their hearing and vision, which has made flight, romance, and predation possible in the near absence of light. This accessible guide, full of intriguing anecdotes, covers all 19 species of owls occurring in North America. 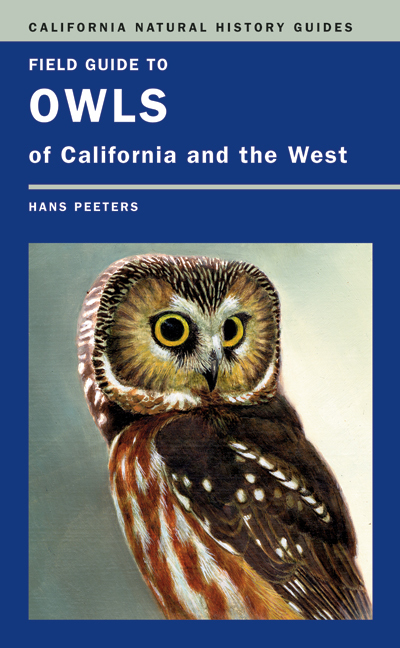 More than an identification guide, Field Guide to Owls of California and the West describes the biology and behavior of owls to make finding and identifying them easier and watching them more enjoyable. The guide also explores the conservation challenges that owls face and tells how owls provide insights to scientists working in fields from technology to health. Hans Peeters, Professor of Biology, Zoology, and Ecology emeritus at Chabot College, is coauthor, with Pam Peeters, of Raptors of California (UC Press), with E.W. Jameson, Jr., of Mammals of California (UC Press) and author of American Hawking. His illustrations have appeared in many bird guides including The American Bird Conservancy's All the Birds of North America, Book of North American Birds, and Birds of South Asia. An award-winning painter, two of his depictions of Golden Eagles have appeared on Mexican stamps.